I recently spoke with one of our new Project Managers who is currently going through our on-boarding training and I asked him what stood out so far with what he was learning about our translation processes. The thing that he thought was remarkable was the process that a document goes through in translation and the amount of quality checks there are embedded in that process to catch any potential errors or confusions. Since one would hope that this is true of any professional translation company, I am going to share with you the insights he gave. Not all translation providers are alike, but assuming that you have gone with an ISO 9001 and ISO 17100:2015 certified corporate translation provider, you can expect that your translation will go through at least three different people during translation, editing and proofing. When a document is submitted for translation there is an entire team that is involved with the final product which is thoroughly proofed and investigated before it is finalized. Beyond translator, editor and proofreader, you have a project manager and may have desktop publishing team all working to deliver you your final translation. There are so many eyeballs that any errors are sure to be caught before the project is finalized. The translator is very important because the translator is the one that gets your project started. Ideally, if you have gone with a top translation company, your translator will have been selected for their background as a subject matter expert in your field with native language translation experience for your target audience. With expertise and experience in your subject matter, your translator understands the content better than a generalist linguist would and can best convey it in your target language. The editor adds more subject matter expertise and native language experience to your translation project. The editor checks the translator’s work to catch any errors before they are moved along in the system. 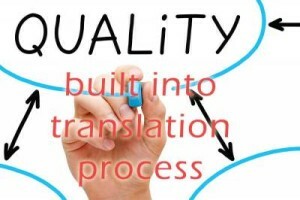 The editor performs linguistic quality assurance (LQA) to make sure that the translation is clear, correct and concise. Publishing quality assurance (PubQA) occurs after desktop publishing when they proof the file. In the process of proofing the overall look, feel and layout of the project, they also will catch if something is missing and notify the Project Manager (PM). If the PubQA team finds errors they notify the PM who then will send it back to the editor for review and to correct any mistakes or confusions that have been made. The Project Manager is responsible for overseeing the entire project. It is the Project Manager that selects the translator(s), editor(s) and proofer(s) and interfaces between the translation team and you the client to ensure that the entire project goes smoothly. It is then the PM who works with the translator and editor to correct any errors uncovered by linguistic and publishing QA. Depending on the size of your translation project, you may have multiple translators and editors, but you most likely will have one PM overseeing the entire project. An experienced Project Manager is your point of contact throughout the translation project and has the ultimate responsibility for finding and eliminating any errors in the project. At the end of each translation project there is time set aside for client review. This gives you the opportunity to review the project and have your own in-country team make take one last look at the translation before the entire translation is finalized. This is another opportunity to provide feedback and to make final improvements to the final translation. When working with professional translation companies you can be sure that your translations are vetted from top to bottom. Quality control is inherent in the process. There are many levels and people on your team that work to make sure that your final product is the optimal translation for your needs. There is literally an entire team giving input to your project that mistakes are sure to be caught. It is very easy to take quality in translation for granted. Few realize how a seemingly simple translation goes through multiple steps and multiple experts to ensure than any errors are caught, re-examined, eliminated and how much your final translation has been vetted. What errors have you found and eliminated during translation? How did you catch these mistakes? Please share your experience with us in the comments section below. Also, please like and share this blog using the social buttons above.